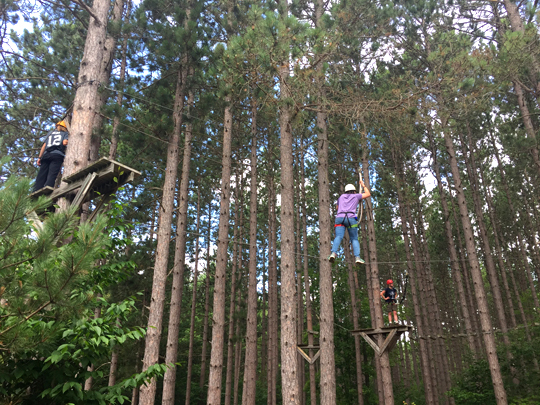 Photo provided by Sarah Balko Campers have the opportunity to complete a high-ropes course at Camp UPeninsulin, a summer camp specifically created to meet the needs of children with Type 1 diabetes. MANISTIQUE — Camp UPeninsulin, an annual overnight camp specifically for kids in the Upper Peninsula with Type 1 diabetes, started on Tuesday at the Clear Lake Education Center. The camp offers activities like any summer camp, but with trained medical personnel on staff to assist with blood-sugar management. “They constantly have to check blood sugars,”said Sarah Balko, the camp’s director. Since these 9 to 17-year-old kids aren’t always able to manage their sugar levels at a camp, concerned parents might keep them home rather than sending them to a normal camp. This camp keeps four doctors and 15 to 20 other trained staff on-hand to help the roughly 40 children. “They could spend all day swimming and then have a (blood-sugar) low at night,” Balko said. Dips in blood-sugar are potentially deadly. Camp UPeninsulin avoids this by testing and monitoring the kids, and adapting their sugar intakes to match the increased activity. The camp also gives kids an opportunity to spend time with other diabetes patients. “A lot of these kids are the only ones in their school or their community with Type 1 diabetes,” Balko said. The only other diabetes-centered camp in Michigan is near Flint, too far for most families to send a child. Camp UPeninsulin is mostly funded by donation, which allows them to charge attendees just $20 per camper. “Once they turn 18, they can come back and be diabetes volunteers,” Balko said.